The ulnar (medial side of Flexor Digitorum Profundus- FDP) and median (all of FD superficialis) nerve are both involved in finger flexion, so how to differentiate in testing? 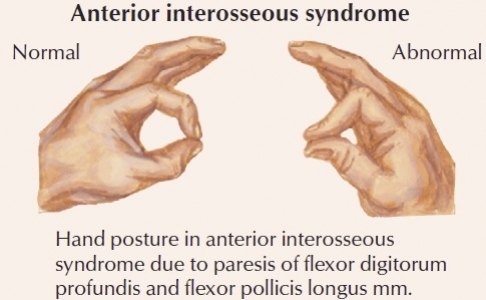 The Anterior Interosseous Nerve (AIN) is a subdivision of the median nerve which innervates deep ant. forearm flexors including the remaining lateral part of the flexor digitorum profundus (for DIP flexion). Have a look at this mechanical test in the picture above. Here you ask patient to use both hands to make and “Okay” sign by forming a circle with thumb and index finger (similar to Froments sign). Median nerve palsy may make one hand produce a ‘pinched circle’ due to weakness in DIP finger (FDP), and also the hyperextension in the MCP1. As opposed to carpal tunnel syndrome (also median nerve), the AIN (of the median nerve) has no sensory fibers and therefore there is no numbness associated with the Anterior Interosseous Syndrome.